It was great to be out of the office for a few days and to visit Infosec, but I was actually quite releaved to be back in the office yesterday rather than in Olympia. I have to say there’s something about shows, which make them exhausting. We had a tally up and we reckon we’ll produce about a dozen pieces of video from this year’s show and they should start going online from Monday. This is the last year that Infosec will be at Olympia, moving to nearby Earl’s Court next year, which is a bigger venue, although I’m not sure it’s necessarily better. Both to me are much more preferable to the horrible trek across town to Excel in east London. Not sure what you think? Are you pleased that Infosec is moving? Do you like it’s current location? 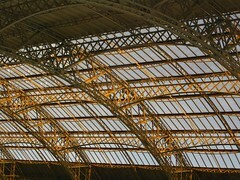 You won’t see this roof structure again, which I think is quite stunning. Or do you think its tired and stuffy (it was bloody hot on Monday) and has poor facilities? Remember they should be witty, but keep them clean please!! Latest scientific discovery, unveiled at Infosec, demonstrates how back tissue is harvested to create new faces. Market leaders? Yes, I thought I’d seen them hanging around down the market. "Ant and Dec soon regetted letting Trinny and Susannah give them a makeover."